Find resources and information here to “get back into” Williams. Admissions: Compare Williams 1970 with Williams today. Academics, Then and Now: New majors and departments. Williams History, ’66-70. Quick and incomplete. Forum Section. Research and add to our History. Then and Now. General Resources. Williams Areas of Study Home Page. New Majors and Departments at Williams since 1970. New Facilities since 1970. 50% of Everything is new! Hopkins Hall Occupation – April, 1969. Moratorium Demonstrations – October, 1969. The Draft – Forum Discussion Topic. Add your experience with the Draft. Campus Maps: Interactive Maps, Williams Today. Sort by Classrooms, Administration, Houses, etc. Campus Map 1968 – 25th Reunion Yearbook, page 2. What the College looked like when we were there. Departments: New Departments made possible by coeducation, increased college size. Majors: New Majors at Williams since 1970. 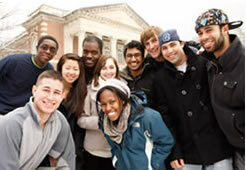 “Ten Percenter” Legacy: Today’s QuestBridge Scholar Program. Vietnam War Larry Hollar article on. Class Gift: Williams ’70 50th Reunion Class Gift – Winter Study.